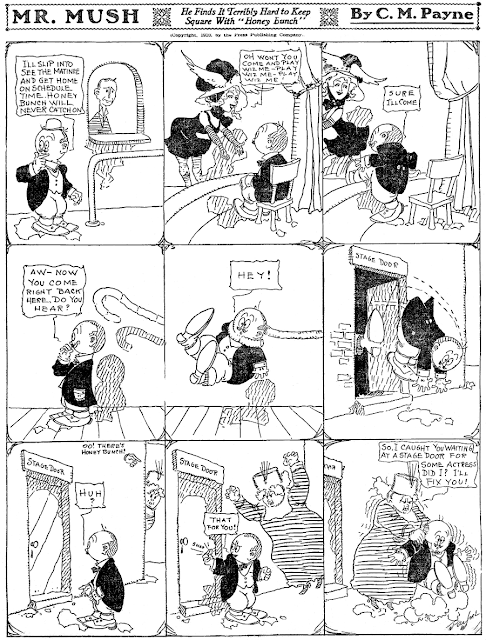 Charlie Payne was a real workhorse cartoonist. Although he doesn't have a laundry list of titles to his credit, that's only because he tended to stick with a series once he started it, and he didn't jump around from syndicate to syndicate much. On the other hand, the problem with him, which would show up more and more in his work as time went on, is that he saved time by eliminating 'frills' from his cartoons -- unimportant stuff like backgrounds. You can already see in these samples of Honeybunch's Hubby from 1910 that by the third sample he has dispensed with niceties like floors, walls, decor ... When Payne really gets going on this kick his characters float around in the panels as if they all live in interstellar space. Anyway, Honeybunch's Hubby, which was originally titled Mr. Mush when it debuted on November 27 1909, is about either a philandering scumbag of a husband, or a poor wronged wretch of a husband. Take your pick, as hubby's role changes depending on Payne's gag of the day. The consistency is in Honeybunch's domineering role, which gradually lessens a bit as the series goes on -- notice that the relative sizes of the two are more equalized by the third sample, from about a year into the series. 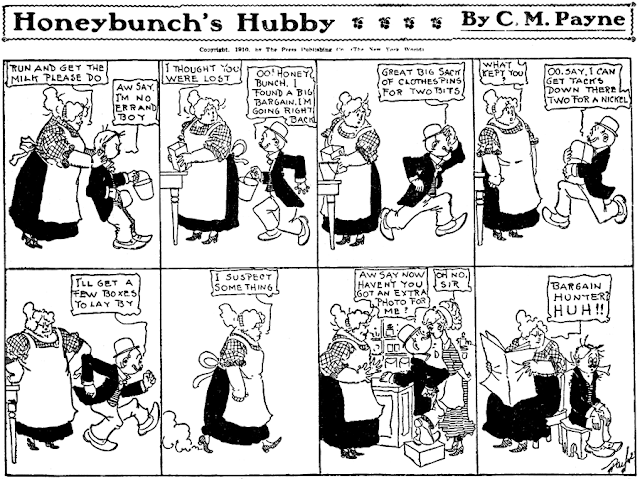 Honeybunch's Hubby ran as a weekday offering in the Evening World until March 30 1911, basically being replaced by the very long-running S'Matter, Pop. But that was far from the end for these characters. 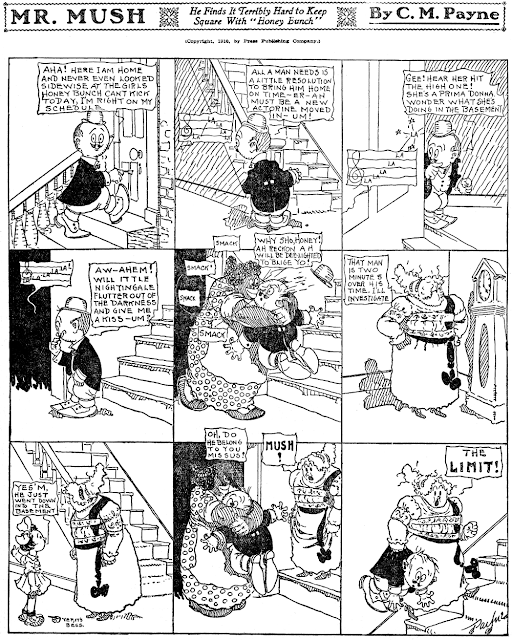 By the 1920s, Payne had settled into a comfortable routine, producing S'Matter Pop as a daily and Sunday series for Bell Syndicate. But when Bell jumped on the topper bandwagon in 1931, Payne did something rather strange. He brought the old strip back, but not as a topper. On April 19 1931, he inexplicably reduced his bread-and-butter strip, S'Matter Pop, to a Sunday topper, with Honeybunch's Hubby as the main feature. The experiment went on for about eight months before Payne pulled another switch, and Honeybunch's Hubby became the topper (albeit a large one that seemingly was also offered on its own) and S'Matter Pop became the main strip again. The status quo held until the Sunday S'Matter Pop was cancelled. 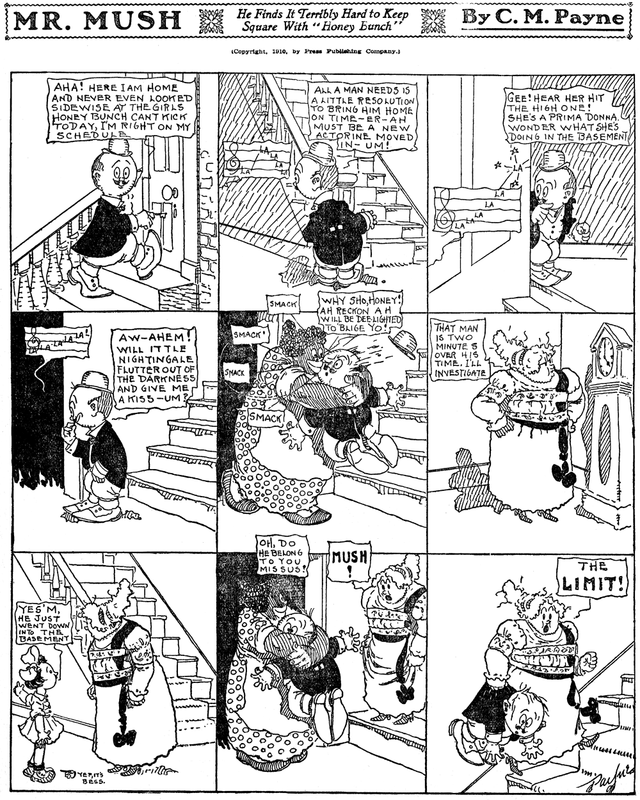 The latest I can find the Sunday running is July 22 1934, but Bell advertised both main strip and topper until 1937, so perhaps there is a longer run lurking out there somewhere. Has anyone seen it past my end date? Hello, Allan--Notice the "guest appearance" of Harry Palmer's BABBLING BESS in the first example.